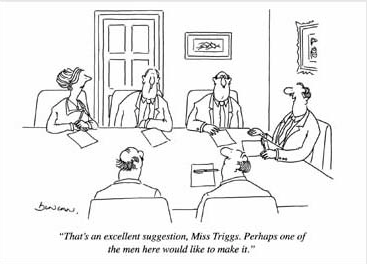 You can tell how old this Punch cartoon is by the honorific applied to the sidelined “Miss” Triggs. But sadly, even though it was first published more than half a century ago, including it in a slide deck in 2016 still elicits the laughter of recognition. What stops you from speaking up at meetings? Even if you know that it’s folly to count on your hard work alone to get you noticed, gaining profile within your organization isn’t always easy. Depending on the leadership, levels of hierarchy, or organizational culture, meetings can feel competitive or fraught. If you’re new on the job or naturally introverted, you might also be reluctant to interrupt, or inclined to reflect longer on the ideas that occur to you, wanting to be sure that what you say will genuinely add value to the conversation. As a consequence, however, your insights may go unshared and your potential remain unrecognized by decision-makers. Meanwhile, others who feel empowered to weigh in – even when their contributions offer little new – end up getting tapped for plum assignments or promotions. At one of our recent Communicating with Confidence workshops, we discussed how to overcome these and other barriers to being heard – obstacles often flagged by women working either in environments dominated by male colleagues, or in positions that are seen as servicing (versus central to) the core business of the organization. Sit where you can be seen: The power position in any meeting room is the one immediately opposite the person chairing the session. Sitting there puts you in the sightlines of the person with the power to recognize would-be contributors. You’re more likely to be seen leaning forward, raising your hand, or even opening your mouth. Don’t let perfection be the enemy of good: Not every comment you make has to be brilliant or even completely original; sometimes agreeing with or building on an already discussed idea is useful, reinforcing its value or suggesting a variation. Identify a potential question or comment in advance: For some meetings, you might consider devoting time beforehand to reflecting on the identified focus and goals. What informs your particular perspective on the issue? If you had to address the situation yourself, what steps would you take? Maybe thinking deeply about the context and potential consequences will help you to identify valuable questions or comments not likely to emerge in the moment. Even if you’re the one chairing the get together, it’s possible to get derailed. Suppose you’ve actually called a meeting for which you’ve developed a carefully thought-out agenda and some concrete goals. You’re clear about the input or decisions you need to extract by the end of the allotted 45 minutes. But the interventions of a strong-willed colleague hijack the meeting, eliciting a spirited debate about a side issue that proves to be more engaging to colleagues than your topic. Stand up and raise one hand. At least some of those in the room will look your way and stop talking. Then say that although the issue raised by your (disruptive) colleague may be valid, you need some specific input, and want to return to the agenda so you can adjourn in a timely fashion. Distribute your barebones agenda, either at the meeting or in advance, including both the goals you need to achieve, and the planned adjournment time. Doing so creates a collective ownership, enlisting attendees to feel responsible for addressing the schedule, and making it easier to keep everyone focused on the task at hand. Recruit an ally or two within your organization to reliably echo, credit or probe your ideas when you express them… To acknowledge an “excellent suggestion”, to ask a question that permits elaboration, and to find natural opportunities to reinforce who shared it first. Despite the fact that all organizations have a vested interest in drawing on the strengths and contributions of every team member, it’s easy for long-established processes or unconscious practices to get in the way of facilitating that. So keep in mind that you looking for ways to be heard has a much bigger purpose than simply reminding people of your value; it’s likely to help to pave the way for other marginalized voices to be heard, too, and that’s bound to make a positive difference to your organization. Although your points are all well taken, I think what the cartoon illustrates is the difficulty women have, not in speaking up, but in being heard. Many times I have been in a situation where a comment or idea I have voiced at a meeting is only ‘heard’ when it is repeated by one of the men at the table. Whereas my idea was let drop, when one of the men “mansplains” it, it suddenly becomes a great idea. Very infuriating!